Today. 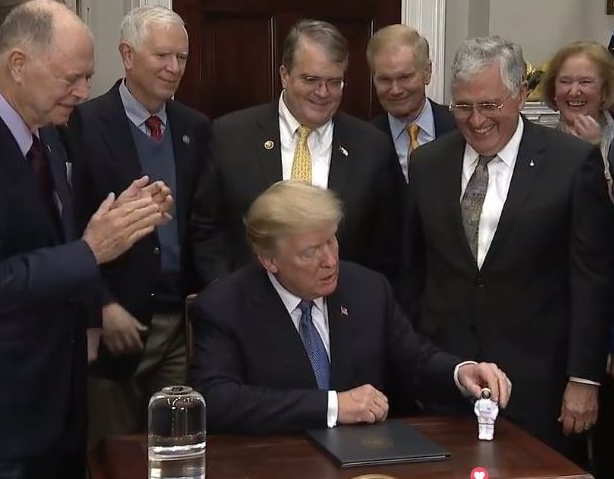 Trump authorized the acting NASA administrator Robert M. Lightfoot Jr. to "lead an innovative space exploration program to send American astronauts back to the moon, and eventually Mars" during a White House signing ceremony. "The President listened to the National Space Council's recommendations and he will change our nation's human spaceflight policy to help America become the driving force for the space industry, gain new knowledge from the cosmos, and spur incredible technology," deputy White House press secretary Hogan Gidley said. The directive, Gidley said, will push NASA to "refocus on its core mission of space exploration" and if Trump does send astronauts back to the moon, they would be the first to visit the lunar landscape since the Apollo 17 mission in 1972.